Gabi DeMartino has a tattoo on her left ankle featuring three of the flower logos from designer Louis Vuitton’s iconic monogram print. 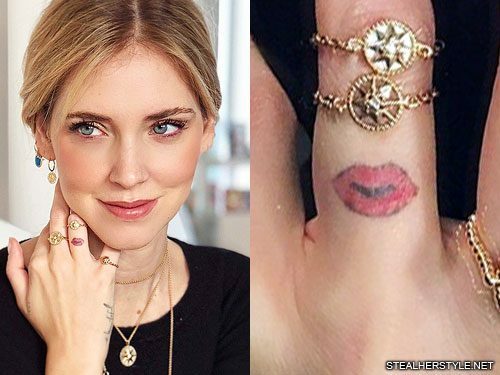 She was inspired by fellow YouTuber Jeffree Star, who has Louis Vuitton logos on his knuckles. 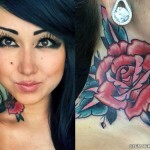 I’ve only ever got meaningful tattoos, so I’ve never got a design tattoo or one that just looks cute. 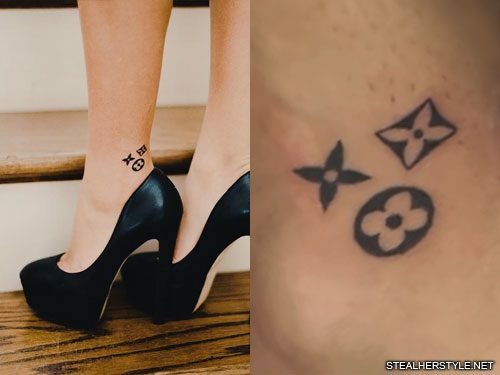 So I’m going to get those little Louis Vuitton flowers on my ankle so that when I wear heels it looks super cute….These are tattoos I’ve thought about for a long time now and I just want to go ahead and get them done. I want them for summer — summer’s like my favorite. Gabi loves high-end fashion and posts luxury haul videos, so it’s no surprise that she’s got a lot of Louis Vuitton items in her million dollar closet. And we mean a lot — she’s got at least 13 LV bags. In the monogram print she has a suitcase, travel bag, speedy handle bag ($1,000), mini backpack ($1,960), popincourt satchel, saint cloud crossbody, and a toiletry bag ($650). In the Damier checkerboard print she’s got the keepall travel bag ($1,840), neverfull tote bag ($1,320), sperone backpack ($1,950), eva clutch, cosmetics pouch ($375), and zippy wallet ($805). She wears Louis Vuitton clothing as well. We’ve seen her in a bikini, denim jacket ($1,580), hoodie, blue scarf ($590), pink scarf ($590), and silk scarf. She even has a Louis Vuitton monogram print pillow in her closet. All in all, that’s around $20,000 in merchandise. 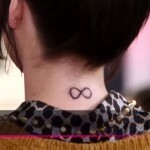 So it’s safe to say that she was already very committed to the brand before she got it inked. I created @chiaraferragnicollection in 2013 and it’s growing like crazy. I designed this blue eye for the first collection because eyes are the feature that I love the most in a person and it became iconic, it’s the logo of the brand now. 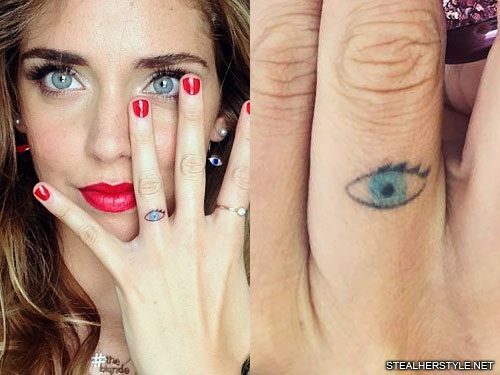 She loves the look of eyes and has been known to wear eye jewelry from many different brands, not just her own. 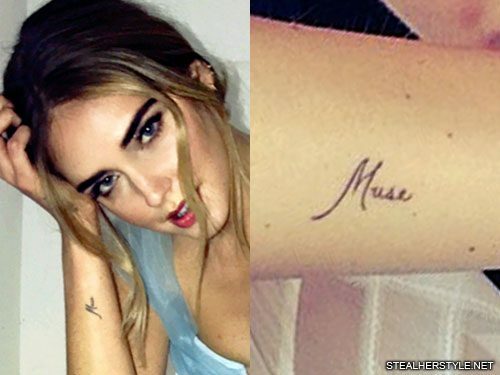 In May 2013, Chiara Ferragni got this tattoo on her forearm that says “Muse.” A muse is someone who inspires an artist, and as a famous fashion blogger Chiara is surely a muse to many designers. She actually sold necklaces inspired by her “Muse” tattoo as part of her limited edition Caia Jewels collection. 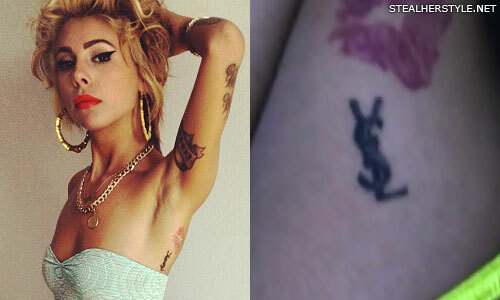 Jasmine Sanders has some hidden finger tattoos on her right hand. Her pinky finger says “swear” to symbolize making a pinky swear, which is when you link pinkies with someone while making a promise so that you both know it’s serious. 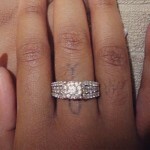 On her ring finger is a tiny clothes hanger. “It finally seems like models are longer just considered human hangers,” she told Allure. “We love being muses for our clients but also want them to let us speak sometimes and show our personalities.” Jasmine is part of the new wave of models who are establishing themselves as celebrities through social media, where she is on control of her own image.